I’ve offered dried mealworms in my yard for a while now, but not in a big way. I would casually toss a small handful into the nearest brush pile each morning for the Carolina Wrens who seem to love them. Because I would gather the mealworms and peanuts in the same little basket to take outside each day, inevitably a few mealworms would wind up in the platform feeder with the peanuts and the Blue Jays would often snap them up after they’d cleaned out the peanuts . 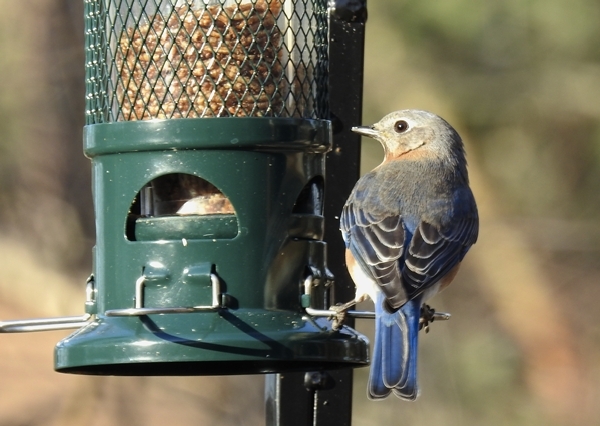 . . but then the Eastern Bluebirds appeared in the yard, and I got serious about the dried mealworms! 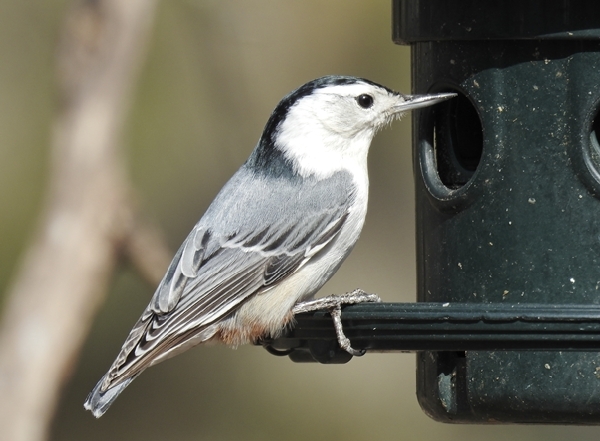 When you first start feeding birds, you might think that you can just buy any birdseed mix, plop it in whatever feeder you like and a wide variety of birds will quickly come flocking. The seed bag probably has a list of all the birds that will eat the food, so all of them should show up at your feeder, right? Well, they might if you are lucky. But it is also very possible you will wind up with a mob of birds you don’t like dominating the feeder picking through the mix and dropping seed they don’t like on the ground to go to waste. Putting the right feeder in the right location is important, but what you put into it is important too. Here are the foods I offer birds (and foods that I don’t) in my Maryland yard, followed by a list of who eats what.